The amount of finds has made the excavators concerned about publishing pictures before items go through scientific analysis and review. If they have not, anyone can publish a scientific paper about it before the editio princeps is prepared. And mistakes are often made in early assumption. Therefore this blog went through an edit before posting – and the delay was necessary. A month in, it seems we have always been here. Discoveries every day, working down to floor levels, discoveries of material items and structures that it is to early to tell of, and an absolutely wonderful esprit de corps between people from many walks of life and many countries. Who can think of it ending? Photos are coming to give you a taste of the discovery, intensity of focus, and smiles in the working environment. As there is one real week of digging left, the general approach will be to expand existing layers, finish up promising areas, and only in certain points make a surgical incision to go deeper. I spent an hour this morning cleaning animal bones with Curator Leora, which will go to the lab for identification, and yesterday observed pottery reading from the top of the hill, Ido’s layer, where there is enough material found in “good context” that many pots will go to be reconstructed. Leora came over this morning out of the office to show a beautiful clay jar stopper, somewhere between 3000-4000 years old. It was placed over a material and laid on the storage jar as wet clay, thus making a very tight fit. The weekly roundup tour took place this morning and you can see the pictures on facebook, together with contributions from various volunteers, including my son Nachliel who came for two days. Look them up! Dr. Dudu Cohen, a master guide in Israel and an historical geographer, has not worked in a dig for 30 years, but moved several tons of earth personally from the dig site to the dump site. Everyone enjoyed his humour, erudition, and may have accepted his suggestion that a certain wall is an agricultural terrace. It was great having him. I have completed my study month at the dig, I hope to visit in the coming two weeks and keep reports and interviews coming to you. AZK: What have you been doing in the excavation and how did you get here? GW: Digging holes in the ground, moving buckets of earth! This is my first dig. Two years ago I was talking to Ronnie McCracken about his Ramat Rachel excavation experience. He said he was going again now, wanna come? I said I’d love to, and here I am. AZK: How would you define your experience? GW: Exhilarating. Hard work, well worth it. It supports Israel, Jews, and involves the bible and history. I looked up all the scriptures before I came. AZK: What do feel when you are attaching the earth and moving out the layers you do so well? GW: I feel association with Israel. Digging for history. That is the key. Exciting. If my wife lets me out, I’ll be here again. I was lucky to be in on the very start of this. It will progress and everyone will see it; I want to see the progress too. It’s a shame I am only here for 2 weeks. AZK: What have you found? GW: Well, we’re seeing a wall appear, it seems the first stones on the top. It is built with the slope, a support wall (currently, week 4, we associate it with the fortress excavated on the top of the hill by Bliss and Macalister). Tomorrow I will move to the next square over to see if I can find the continuation of that wall. There’s a mud brick wall on one side, and a stone wall. Now, today’s pottery came up totally different than before; a thinner finer pottery. I dug only 10 cm. down today and it is a complete change of pottery. AZK: As a builder do you have a different view in any way? GW: When I approach how to dig my experience stands me in good stead. Keep it level, that’s the easiest route to dig. Fill in the buckets. pull ’em and stand ’em up, expend the least energy. Tracking the difference in soil levels- I’m used to doing that – filling in land before foundations; making marker posts. AZK: Have you been here before? GW: This is my third time to Israel. It is well worth coming. The first time I came, I had a fantastic feeling when being in the land, in the bible. You can begin walking in areas where Jesus walked.- albeit a lot higher than that historical level…. 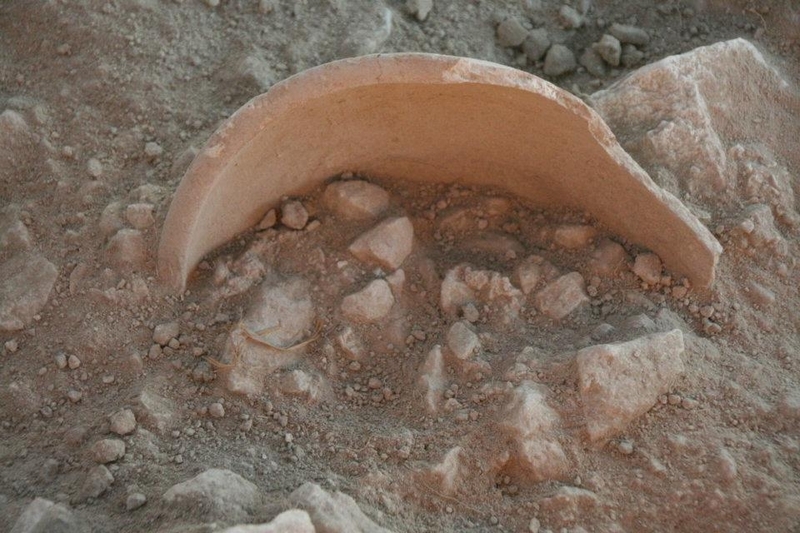 AZK: What are your thoughts about the experience of excavating at Tel Azekah with this group? I am sorry to leave and go home. It would be nice to stay longer but I miss the family. I belong to Tongham Christian Fellowship, .a non denominational church started 15 years ago; now with 80 people. I plan to encourage the teenagers of our church to come out – it will do them a lot of good. I enjoy hearing the bible from Jewish perspective. We have a debt to Jews for keeping the bible intact for us. Those who bless the Jews get blessed, those who curse get cursed. Rome lost its empire, for example. It is a very precious time to be here. It is going to be a great week !! “We have achieved 250 percent of what we expected.” “What you have here in Area E- Azekah East- would satisfy me for the end of the season. Here we are with three weeks still to go!” Comments like these by Prof. Oded Lipschits in the past few days give a taste of the way we feel. I write these words in the dig office surrounded by stamped jug handles, animal bones, weights, coins, and other objects, and an army of Survivor iPads recording the myriad details of the dig: What was in this defined area- locus, what was above, what was below it, around it, what were the special finds in them and at what height were they found so that scholars decades from now will be able to accurately retrace, understand, and argue about conclusions, and find parallels to explain their own dig. On top of the tel in Area T, an ancient building was sliced through; a very deep cut that took days to clear out. We thought we finally hit a trench made by Bliss and Macalister 110 years ago, but it did not seem as wide as their descriptions of their work. The archaeologist working with parks visited and explained it was a latrine pit of the Israeli army in the 1960s! Secondly, last Thursday Haim Semach, an experienced builder, looked around to see where an embarrassing smell came from, and no one claimed responsibility. He began to suspect it was coming from the ground. Not meaning a pun, but it is a double entendre, he told the archaeologist., “I smell something here!” ” Go for it!” In Haim’s language that means full force! Within five minutes an opening appeared. And for three days now Omer’s group in the Lower South terrace has been following what he started- there was refuse in an underground area, around and under big boulders, whose nature is still unclear. Omer has been blessed with some of our heaviest hands on the pickaxe and axe. I have been doing an area by area review as a record of the dig, and have received comments to keep posts short. Let me know your thoughts. My post title means that in all the areas walls and even some destruction layer floors have appeared that should permanently change the sights visitors will enjoy and enrich the historical record. This is a wonderfully auspicious beginning. New volunteers have joined us and Bob Cargill traced 14 languages on site this morning. Watch for that video tomorrow! The fast day of Tisha B’Av slowed our writing pace, so let’s just happily announce that architectural features have been found in every area, and hints of destruction floor spaces seem to be coming to light. At the top of the hill Ido Koch’s area has produced 200 finds from the floor area, with wet sifting required, and recording details which demand the complete attention of the total station manned by Surveyor Shatil. GIS work will then be able to reproduce the installations and objects on the floor and recreate this massive structure commanding the hilltop. The vast amounts of pottery being “read” and interpreted each day is gradually leading to conclusions about the buildings and fortifications coming to light on three sides of the hill, but area leaders are wisely reserving judgment. About 1000 objects so far are boxed and bagged and will require research and lab work, according to Leora Freud, with 3-4 inscriptions of different types. From tomorrow I will begin to take a little break from digging to briefly visit each section myself, which will help me share news with you. Pictures are steadily coming to our facebook page – have a look! On Friday we were honored by a visit form the Australian Ambassador, and new faces are here this week, mostly from Germany led by Prof. Manfred Oeming, with a touch of South Africa and elsewhere. All told about 300 volunteers will work here this season. Day Ten: Azekah East Paydirt! It started as a regular day. In most sections work continues, areas are expanding. On top Ido is expanding the area of the building he found and reaching more walls and floor area with objects, including a series of “rollers” which so far we know of no parallel. Everyone else is happy with progress and think they are finding walls and floors. After days of digging in modern fill, and removing layers of rocks showing more rocks– some stones appeared in a line on the slope of Azekah East up in Parker’s section. Oded looked at the hillside and suggested that there should be a continuation. We scraped off a section of hill. Paydirt! This dig has found ancient fortifications!!!! Tomorrow is the weekly tour of the whole site with the whole group, joined by Socho (who have enjoyed great finds in the last two days).